At the beginning of October Fairfax Media (which owns Computerworld) moved its productivity environment from Microsoft Office to Google Apps for Enterprise. I've been using Google Drive (formerly known as Google Docs) since 2009. The best mobile experience I've had with it is with Google's own app for Android phones and tablets, which is free from the Play Store. Its feature set is trimmed down from the web app experience, but it has been implemented very cleanly. This makes it a great in-between app for when you're out and about and away from the work desktop. 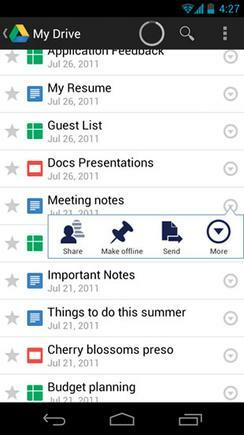 The Drive app has basic editing features such as rich text formatting, adding tables, and inserting pictures - all of which are organised neatly on the limited screen real-estate. The feature making the best use of the phone or tablet hardware is the document scanning tool, which lets you take a photo of a page, using optical character recognition (OCR) technology to convert it into a Google document. For those working in a collaborative environment, the latest version of the app has commenting functions and you can continue to work on a document which is being edited by other people. Google's focus is on the cloud, but if you're heading out of connectivity you can always download the documents to your device to work on them offline. Then when you're back in range, the document will sync back to your Drive account. Using an Android tablet, you can play a Google Presentation (Google's version of PowerPoint) to clients. Just don't expect to be able to edit this type of document on the fly, right now you can only rename and do very basic editing of presentations. Drive isn't just a document processing tool, it's a cloud locker in its own right. A free account on Google comes with 5 GB of space, which you can use to upload ZIP files, photos, and videos, accessible from any internet capable computer. Update: Originally this article mistakenly stated there was no iOS version of Google drive. There is indeed an app available from the iTunes App Store.